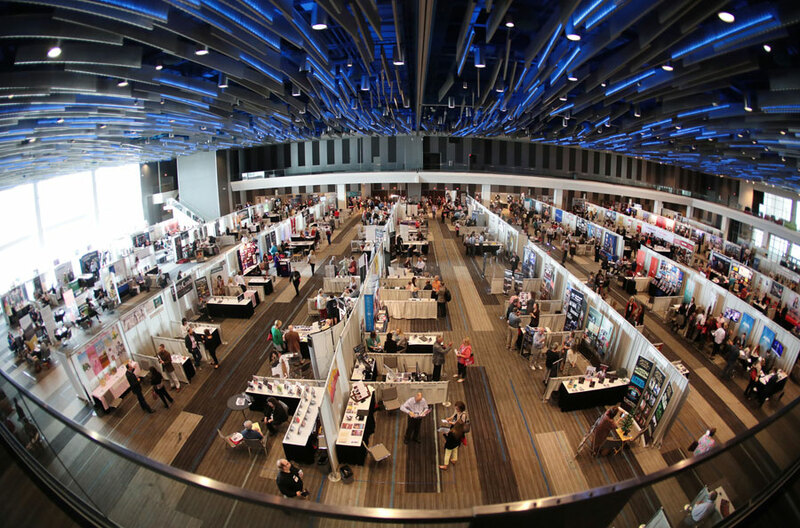 View from above the 2017 Marketplace in Columbus, Ohio. Photo by Terry Gilliam. Exhibit hall. Resource room. Expo. Trade show. Performing arts fair. Depending on the conference, there are a lot of names used to describe the space where attendees meet one another. At the Arts Midwest Conference, we refer to it as the Marketplace, and sometimes it can feel like a street market where buyers and sellers interact, but the name Marketplace also reflects a broader understanding of the performing arts “market” as a whole. 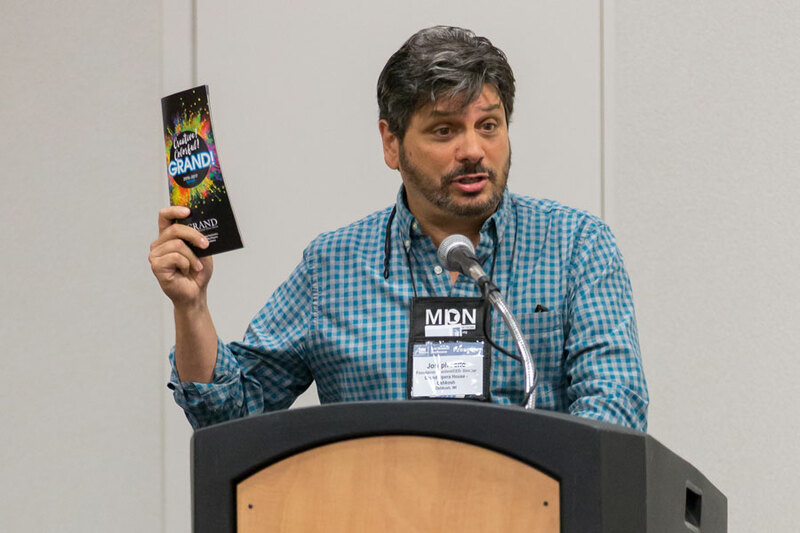 When you attend the Conference, you see in physical form all of the behind-the-scenes networks, relationships, and transactions that make up the performing arts industry. For four days, work that normally gets done via email and phone happens face to face. 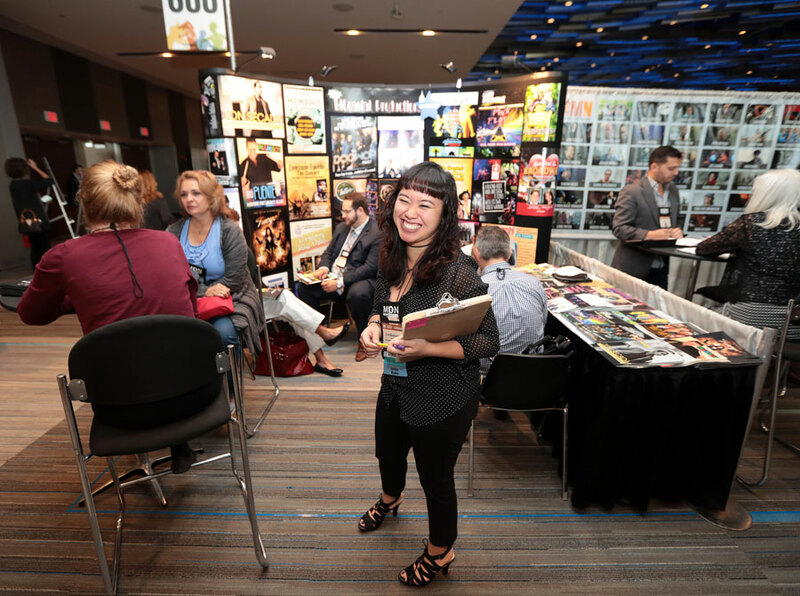 We hear again and again that attendees value the opportunity to connect with colleagues in person, and our Conference has developed a reputation as a true “working conference” where both presenters and artists/agents/managers are ready to get down to business and discuss concrete booking opportunities. Yet on the other hand, we’ve heard from attendees expressing concern about the overall atmosphere of the exhibit hall performing arts conferences, and it became clear to us that we needed to think about what it would take to breathe some fresh energy into the hall. “We are working to make the Marketplace a destination where people will want to hang out and socialize when they are not meeting for business,” said Tommy Hensel. Tommy is Conference Co-Chair this year with Shantel Dow, who agreed that programming for the Marketplace should be a priority in 2018. “This year you will notice a more comfortable and inviting atmosphere in the exhibit hall,” Shantel said. Both Tommy and Shantel helped Arts Midwest develop two brand new activities designed to encourage connection and collaboration during Marketplace hours—one at the start and one halfway through the Conference. Read about both below! An exhibitor greets attendees from her booth at the 2017 Conference in Columbus. Photo by Terry Gilliam. Thursday, September 6, 2018, 9:30–10 a.m.
Before the hall officially opens on Thursday, attendees are invited to join their colleagues for a quick and easy networking game called It’s a Match! Famous Duos to foster new connections and spur new types of conversations in the hall. Exhibitors who signed up to play must be in their exhibit space starting at 9:30 through 10 a.m. on Thursday. One half of a clue will be pre-placed in your booth, and it will contain one half of a famous duo (ex: Cher). Starting at 9:30 a.m., presenters and any other attendees who want to play must go to the entrance of Hall AB and pick up their half of a clue (ex: Sonny). The clue will also contain a hint about where in the hall they should look for the other half of their duo. Take a selfie with your match, and you’ll be entered to win a prize if you post the photo to the Arts Midwest Conference app. Professional Development at the 2016 Conference in Milwaukee. Photo by Joshua Feist. Friday, September 7, 2018, 2:00–2:30 p.m. The selection criteria and format for this fast-paced and creative pitch session is intentionally open-ended. Rather than a typical ballroom or meeting room, the pitches will place in a marketplace lounge we’re calling The Porch. Selected participants receive three minutes, an open stage, a single microphone, and an audience of colleagues to share your aspirational pitch. Props and instruments are limited to what can be carried by a single person as they take the stage. This year’s pitches will be announced soon! How were the selected? We’re simply drew the names out of a hat, because we believe randomizing the selection process helps provide a platform for new voices and fresh perspectives.